Resident bird in most of central Europe. The Mute Swan can gather into large flocks during the Winter. 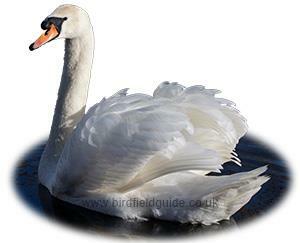 The Mute Swan is a large bird, known for being tame but also aggressive when feeling threatened. Adults frequently attack dogs and humans if the nest is approached. Frequents park lakes and ponds, slow moving rivers and sheltered estuaries. Often very tame taking food from visitors. In Winter it can often be seen 'grazing' in small flocks on farmland. Adult and Male and Female Mute Swan. The adult Mute Swan is a large familiar bird, all white with a reddish-orange bill and a long, often arched neck. The Male bird has a large Black facial knob above the bill, the female has a smaller facial knob but it is still a distinctive feature. 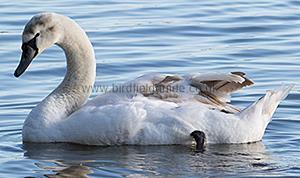 The Juvenile Mute Swan has a Brownish body and a grey bill with Black edging. As the Juvenile gets older it gradually becomes paler, eventually becoming all white by it's second Winter.